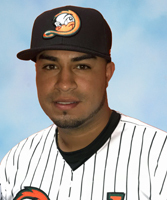 Cabrera returns for his second season with the Ducks and 12th in professional baseball. The catcher joined the Ducks in May of 2018 and went on to play 84 games with the Flock. He compiled a .268 batting average with three home runs, 31 RBIs, 27 runs, 84 hits and 21 doubles, which was tied for second-most on the team (Lew Ford, 33). The Venezuela native was selected to play in the Atlantic League All-Star Game, held at Long Island’s Bethpage Ballpark, and started the game behind the plate. During the postseason, Cabrera posted a .378 batting average, the highest among Ducks players who appeared during the entire postseason, and added an RBI, two runs, three doubles and two walks.